"JSA/JSA, Chapter 1: Making History"
For the first time in a long time I have what a lotta folks call "nightstand reads". It's not often I get to do any reading where I'm not trying to write, script, or speak about it... and, I suppose at the bottom of it, these "nightstand reads" aren't necessarily "without consequence" either. 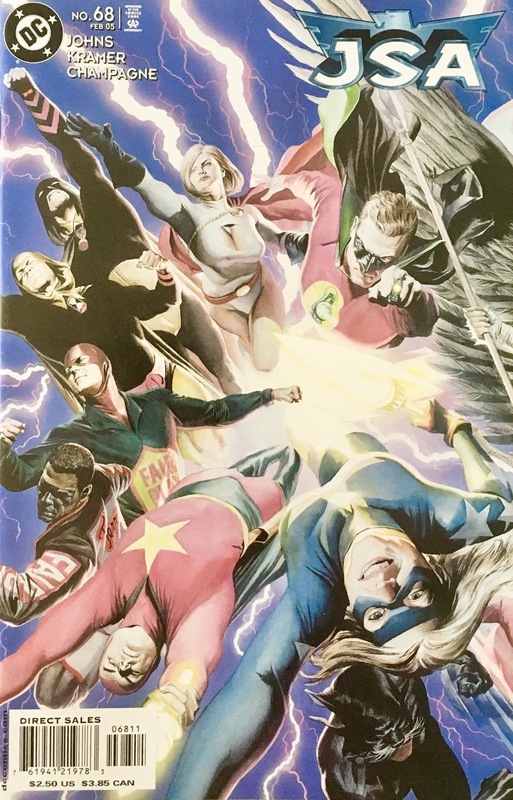 Right now I'm reading the America vs. the Justice Society miniseries from 1985... with half-an-eye toward doing something with it a bit later on. 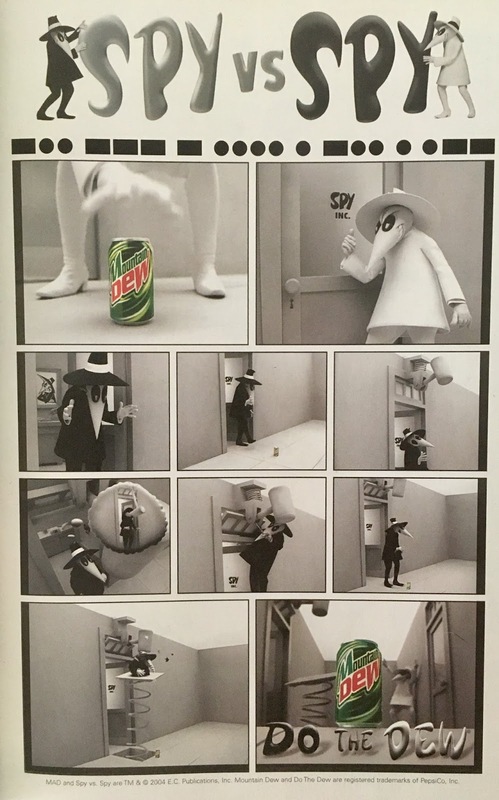 It's a highly recommended little mini... and boy howdy, is it dense! I mean, there are footnotes to the footnotes! In reading that, I recalled a story from JSA that evoked several of the themes from that story, however with a decidedly post-Crisis twist. It's been... almost a decade and a half (yikes) since I last read this, and I was curious how well it aged. We open in the wee hours of the morning in Blue Valley, Nebraska where Stargirl has returned home after a long battle with Solomon Grundy. 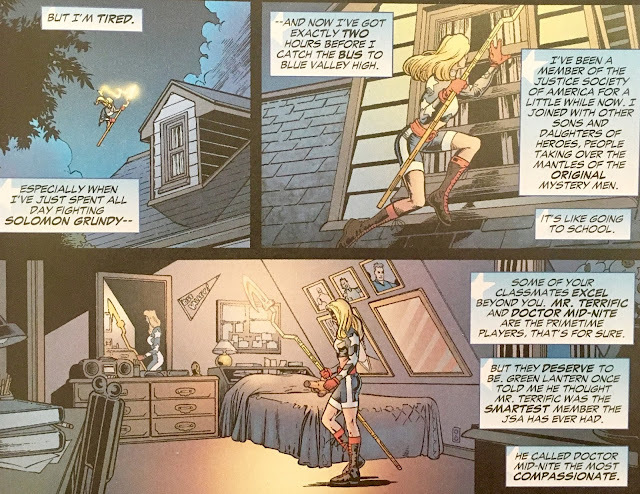 She reflects on her performance as a part of the Justice Society of America before passing out on her bed. We then jump to a quick and dirty retelling of the JSA's "retirement" back in 1951. The House Un-American Activities Committee presses the heroes to prove that they're "good Americans" by removing their masks. For a response, the get the big "uh-uh". Green Lantern has heard more than enough from the stuffed shirts, and pulls the ol' vanishing act. After the Society vamoosed, one of the politicians smiles, he knows this is all going according to... history? Back at the Gotham City Brownstone, the Justice Society consider their options. A consensus forms, they still don't wish to unmask... however think it might not be the worst idea to retire none the less... after all, the war is over. We jump to a week later (in 1951). 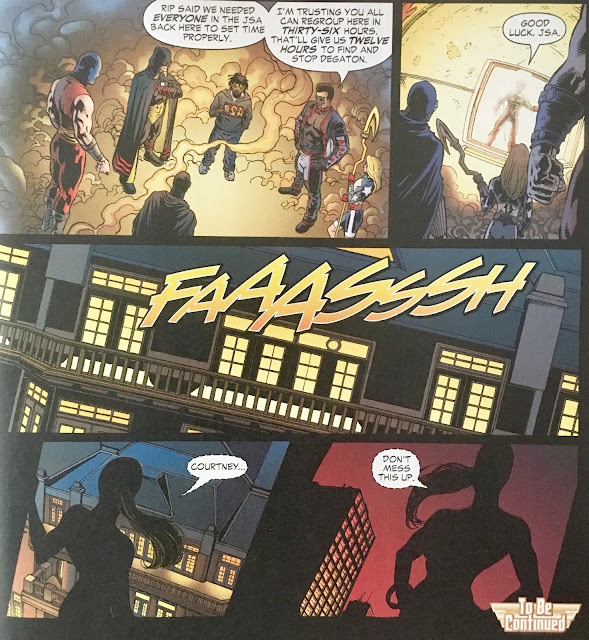 The newspaper headlines suggest that the Justice Society of America might have ties to the enemy... hmm, they must've gotten a hold of Batman's super-secret diary. Anyhoo, Per Degaton arrives... and is informed that everything is going according to plan... except that "the Hunter" is still on the loose. Back in the present... it's now morning. 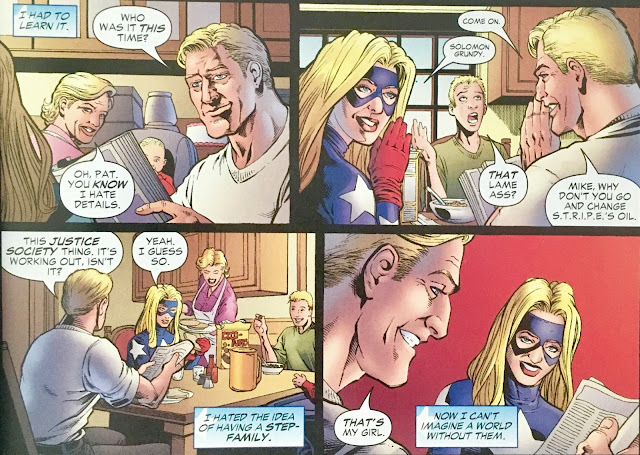 Stargirl heads downstairs for some breakfast, and provides any potential new reader with adequate enough backstory on her family. She mentions that her step-father, Pat Dugan was Stripsey, the partner of the original Star-Spangled Kid... and all things considered, she is happy that he (and his son) are now part of her family. Suddenly... the world goes red, and masked assassins appear. With their first shot, they kill Pat. 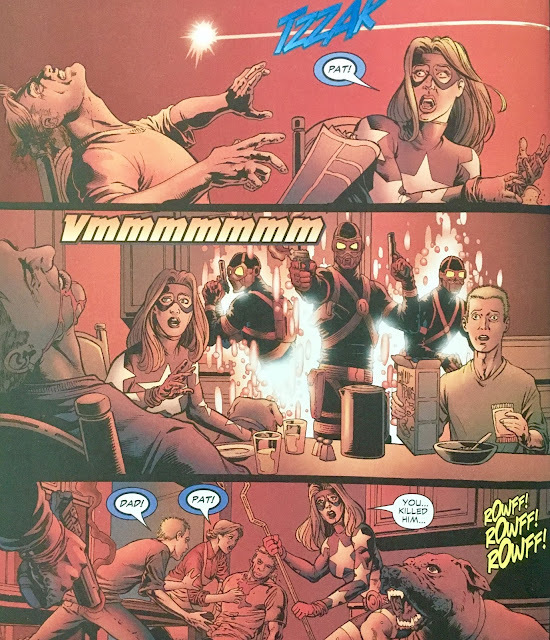 Stargirl fires back with her Star-Rod... but it's too late, the assassins have already murdered her mother, step-brother... and little baby sister! The New DC, folks! Courtney goes like super-nova with the Star-Rod and blows out the side of the house. She pins down an assassin, looking for answers... when she doesn't get any, she kills them all?! She then kneels next to her fallen family... hoping that she'll eventually wake up. Suddenly, a man arrives... he informs her that time is currently changing, and there is still an opportunity to set things right before it "sticks". 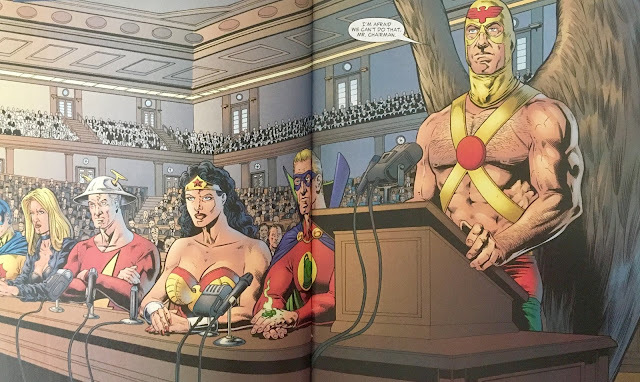 Also, the Justice Society never un-retired... so, most of her life to this point never really happened. They hop into his time-sphere. This fella is, of course, "the Hunter", as in Rip Hunter... Time Master. He informs Courtney that the assassins are a part of a group called the Red Morgue, and they hail from the year 2666. 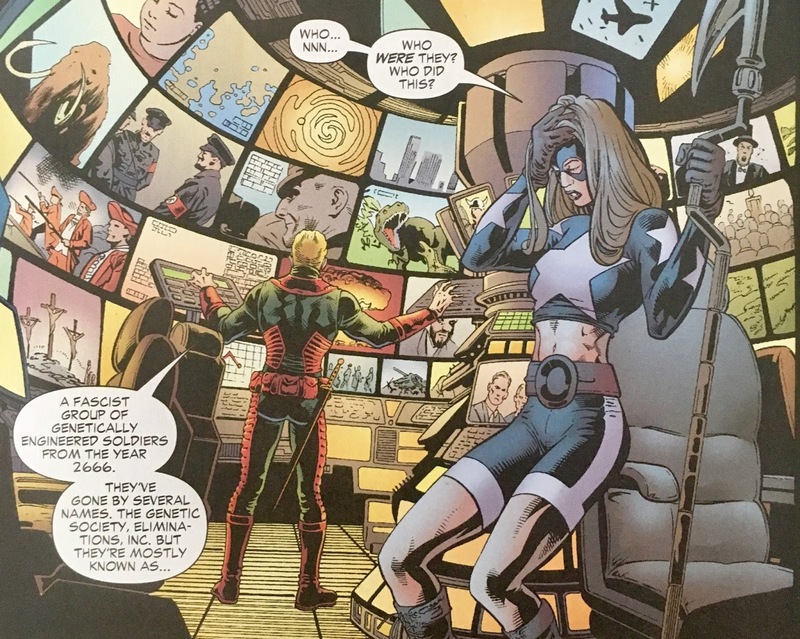 He gives her the skinny on the Time Masters and Linear Men... and mentions that part of their responsibilities is to stop any time travelers from committing "cradle-murders"... which, isn't something I'd necessarily wanna read month after month, but a really cool idea none the less! 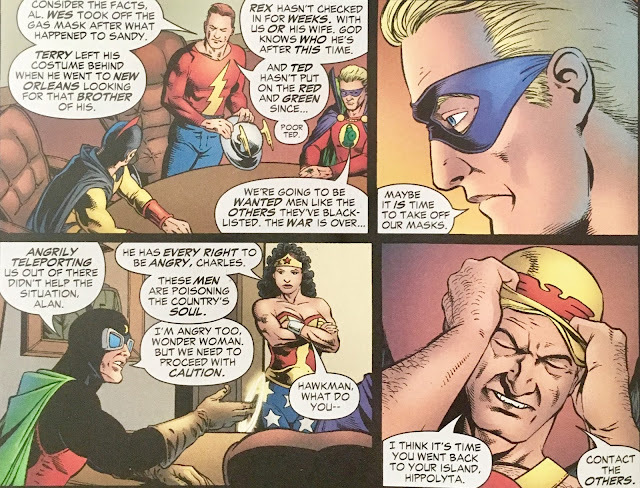 He continues, filling her in on how and why the Justice Society will never "re-band" after their retirement... he mentions that they will be found guilty of treason... yeah, they definitely found Batman's super-secret diary, right? The time-sphere arrives at its destination... the JSA Brownstone back in 1951. 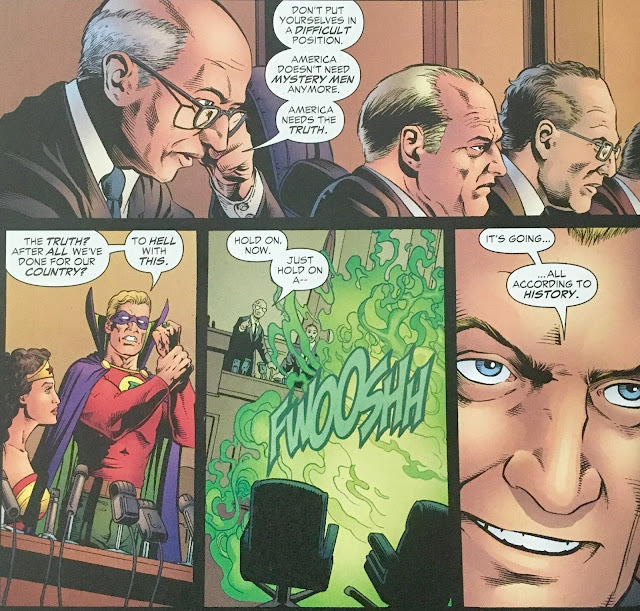 There, Courtney is joined by many of the "new generation" of the Justice Society... Mr. Terrific (Michael Holt), Jakeem Thunder, Dr. Mid-Nite, Sand, and... Atom-Smasher. 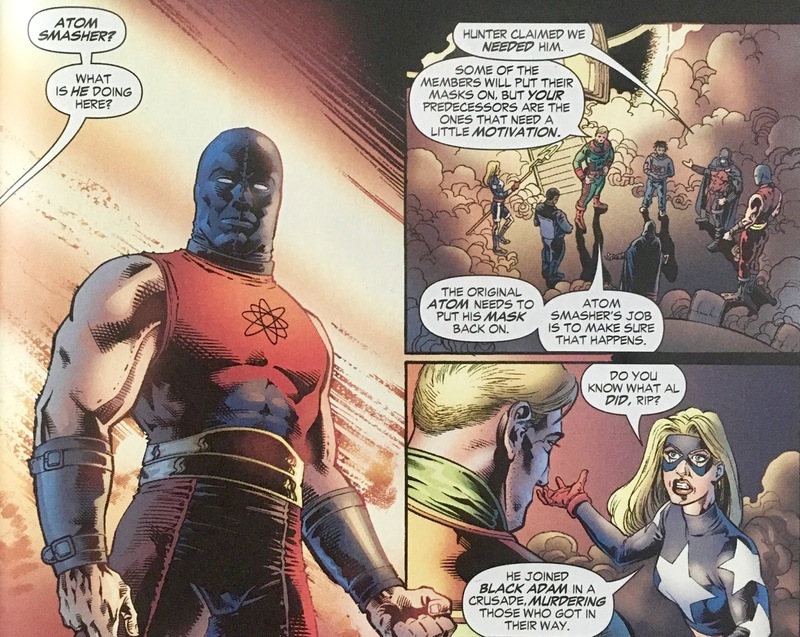 A quick update... Atom-Smasher isn't exactly Courtney's fave fella at the moment... he did just go on a rampage alongside Black Adam. Rip insists that he's necessary for his plans. Rip then... leaves! 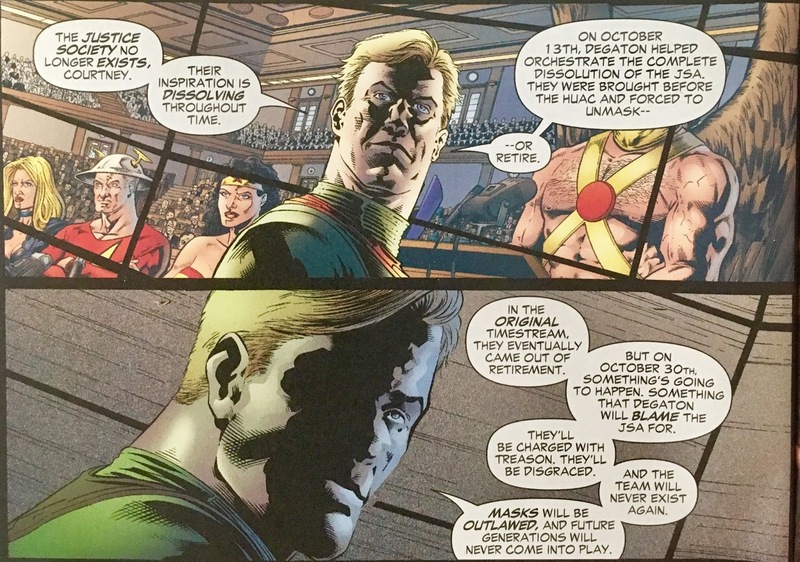 He hops back into the time sphere, wishes the Junior Justice League the best... and beats out of dodge. We close out in the shadows... with a woman whispering that she hopes Courtney doesn't mess this up. 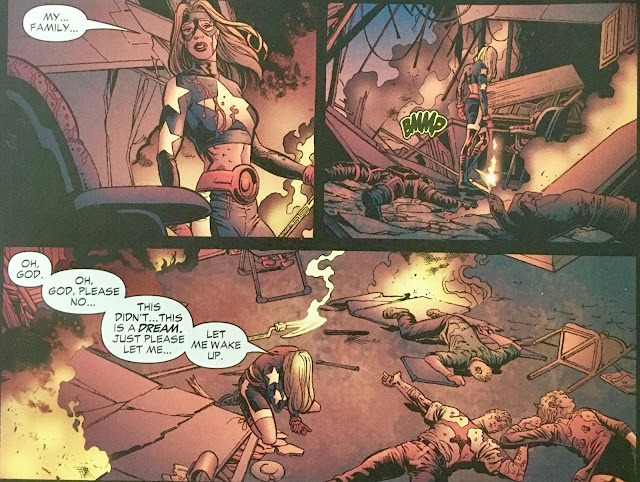 This definitely gave me pangs of America vs. the Justice Society. I can't say for certain that's where this story is headed... it's been quite a while since I sat down with it. Still really dig how it evokes a similar feeling... really paying tribute to an all-but-forgotten story, or perhaps a never-known one to post-Crisis readers... I can honestly say that I didn't know anything of it back in 2005. At the same time, America vs. the Justice Society isn't required reading to appreciate this "JSA/JSA" arc. It's kind of the best of both worlds. I really dig Johns' Stargirl. She's far less "yass" a character than I fear she would be if she was introduced nowadays. Here, she's a girl who's learning as she goes. She makes mistakes, and learns from them. We don't seem to have the patience for that sort of development anymore. 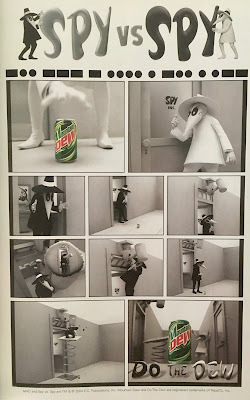 Hell, if you show a certain kind of character to have any kind of weakness at all, the creators are all but chased off social media with digital pitchforks. 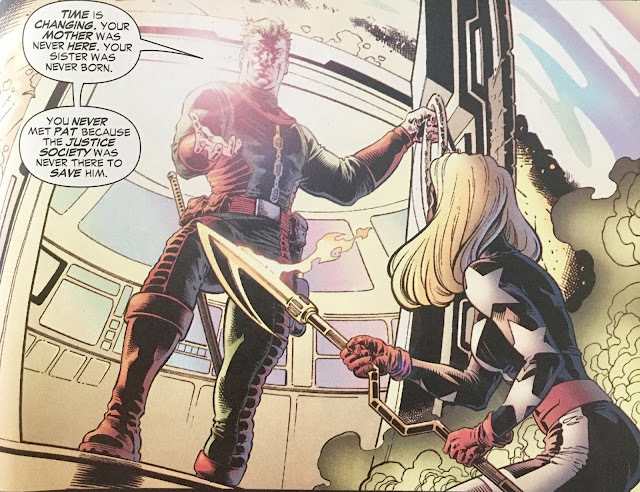 Even in her internal monologue she mentions how she might've started her "heroes journey" for the wrong reasons, but has come to learn just what it means for her to be a hero. 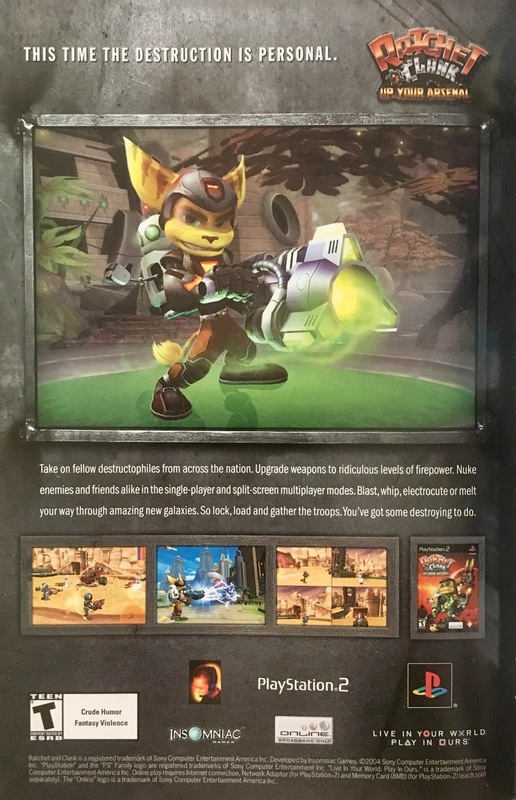 I really dig that. Also, her kinda running down and analyzing the "Junior Justice Society" report card was a sort of "awareness" we don't really get any more. I really like the idea of their being a "second generation" of the Justice Society. It's a concept that can't really be pulled off on many other teams. I mean, there are New Mutants to X-Men... but, they're sort of their own thing. These two generations of JSAers fill the same roster. The juniors learn from the elders... and the whole dynamic feels more like a huge family rather than an organization. I'm not sure if I worded that properly... just one of those "write by feel" moments. 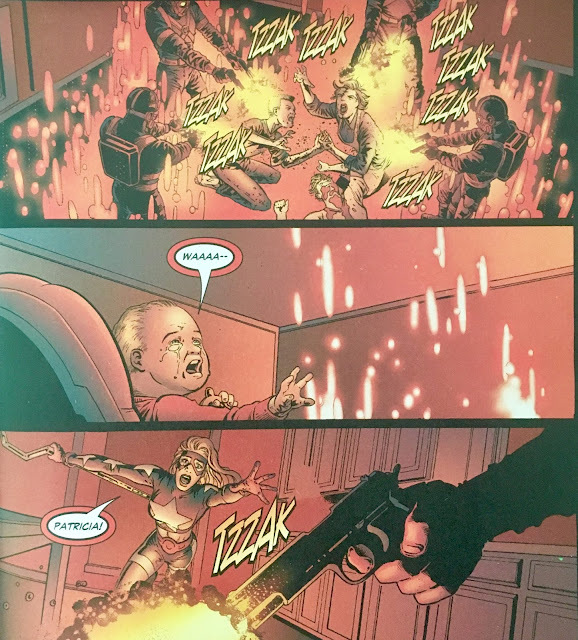 There's one problem... if you could call it that... that I have with this issue (and era of DC Comics), it's the hyper-violence. I mean, we get it... the Red Morgue are bad dudes. I don't necessarily need to see them snap a dog's neck and shoot an infant in her highchair to prove it. 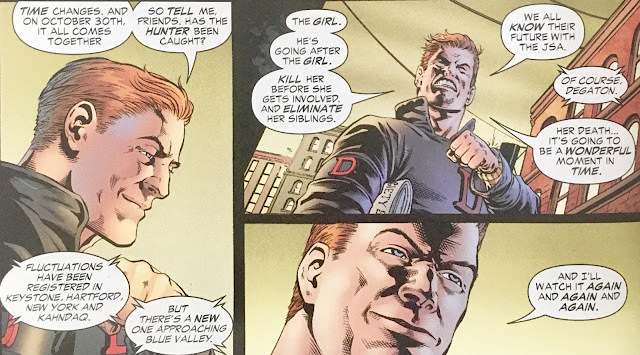 I hate pinning all of this sort of thing on Didio's arrival... but there is a certain amount of observers logic in that. Many of the books got a fair amount "darker" with his arrival... perhaps just another sign of DC Comics being a bit "behind the times". This darkness and (relative) gore would be right at home in 1995. By 2005, it's both excessive and a bit embarrassing. Overall... had a great time with this issue, and I bet most fans of DC Comics would too! This bugger is available digitally. Also, if you're so inclined, America vs. the Justice Society is too!